Significant improvements are planned at the Passport Office. THE ONLINE PASSPORT application service will be extended to children by the end of this year, the Department of Foreign Affairs has said. It comes as part of a “significant expansion” of the passport service which will see around 70% of applicants able to renew their passport online, a spokesperson told TheJournal.ie. And, next year, the department plans to work on a method for those applying for a passport for the first time to do so online. The news comes after Minister Simon Coveney told the Dáil last week that developments in the Passport Office to include applications for children online will make the process “a lot faster”. That update came as part of questions put to the Tánaiste regarding how passports are processed, and how TDs had found petitioning the office on behalf of constituents. Fianna Fáil TD Niall Collins, speaking after questions had been put to Coveney over passport applications, said that it was “important to give credit where credit is due” and praised the Passport Office. Figures released to TheJournal.ie have shown that politicians had made nearly 5,000 representations to the Passport Office on behalf of their constituents over the last two years. 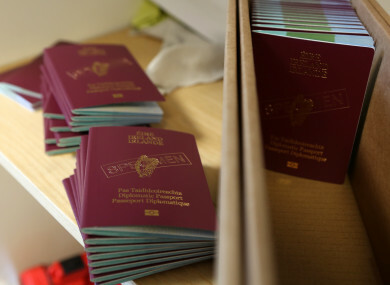 In the first five months of this year, there were a record 500,000 applications for Irish passports, and extra staff had been enlisted to help deal with the large number of applicants. Speaking to the Public Accounts Committee in June, Department of Foreign Affairs secretary general Niall Burgess said is “a matter of immense frustration” for staff at the Passport Office that it’s taking longer than planned to process some applications. Burgess said the service “for the most part” is working well but acknowledged that many people were concerned they wouldn’t receive their passports in time for travel plans. Speaking last week, Coveney defended staff at the Passport Office and said work was afoot to relieve the pressure on them. He said: “Many other Deputies have also been pushing hard to get individual cases across the line and the Passport Office staff have shown remarkable patience and professionalism. We need to make sure that the system is not under that kind of pressure next year and that we take on a sufficient number of temporary clerical officers. Once we get the online system working for children, the process will be a lot faster. An awful lot of family passport applications got caught up in the manual system because it is not yet possible to apply for an updated child’s passport online. Since the possibility of renewing passports online was made available for adults in March 2017, 265,000 applications had been received. “The online service has demonstrated efficiencies for both the citizen and the Passport Service with an average processing time of less than 10 working days,” the department spokesperson said. Coveney actually told the Dáil that the name of the Passport Express service – the passport service you can apply for through your local post office – “suggests to many that it is the fastest way to get a new passport but that is not the case”. It is the online service that is the fastest for renewing the passport, according to Coveney and the department. The spokesperson said: “Work is ongoing to significantly expand this service to children renewing their Passport as well as applicants who require a name change, an observation on their new passport and those wishing to replace a damaged passport. We are also developing a system whereby people will be able to provide the documents to support these applications from anywhere in the world. The expansion of our new online services will be launched by the end of 2018. An extensive engagement campaign will coincide with this launch to promote its use as the fastest and most convenient way to renew a passport… In 2019 work will commence on the extension of our online platform to cater for first time applications. Email “Parents to be able to renew their children's passports online by end of the year”. Feedback on “Parents to be able to renew their children's passports online by end of the year”.